I first encountered William Shakespeare’s The Tempest in a survey course in university. The nuances evaded me and the plot and intrigue were overwhelming. 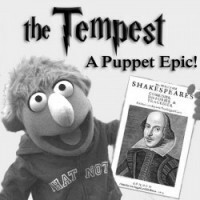 All that has become clear now that I have experienced The Tempest … A Puppet Epic! at Palmerston Library Theatre, part of FringeKids! at the Toronto Fringe Festival. The Tempest … A Puppet Epic! is written by Tom McGee (and William Shakespeare) and directed by Sarah Bruckschwaiger. The performance begins as a white bird makes its way from the back of the theatre to backstage without explanation. The puppets and their masters then convene on stage and decide to put on The Tempest for us. It is, they explain, supposed to fill the void left by the conclusion of the Harry Potter franchise. And so it goes … Prospero succeeds in unseating his usurper, Alonso, and foiling the take-over plans of Caliban and Stephanie-o. Miranda and Ferdinand fall in love and Ariel is granted his freedom. The mysterious bird returns in the epilogue as the embodiment of Ariel’s spirit to tie up all loose ends. Tom McGee’s script is fun and full of 2012-compatible references. Miranda summarizes the prologue in a tweet. Poor Alonso is lost at sea with nowhere to charge his iPad. When Fernando admits to Ariel that he’s lost, Ariel advises using Google maps. And what Shakespearean adaptation would be complete without a self-reflexive style? The best example of this comes after Prospero issues the statement, “No one would be foolish enough to stage a tragedy for children!” Enter performer Merritt Crews carrying a poster for Romeo and Juliet … A Puppet Epic!, the company’s 2011 Toronto Fringe Festival hit. The children loved the melodrama. The adults loved the more sophisticated references to pop culture. As for the acting, it is a solid and dynamic cast. There is not one weak link in the group, which is impressive considering its size (7 players). The puppet masters are extremely emotive and it’s hard not split focus between them and the puppets they’re giving life to. Shakey Shake & Friends is a company that likes to have fun and gives 100%. If you have kids or are a kid at heart, or if you like Shakespeare, this is a must-see. I only wish I could have seen something like this as a young person. Perhaps the magic of make-believe works best on the most weathered of us.